Southern Exposure's Alternative Exposure grant program supports the independent, self-organized work of artists and small groups that play a critical and significant role within the San Francisco Bay Area arts community. In Round 12 of the Alternative Exposure Grant Program, Southern Exposure is distributing $75,650 to 17 projects with awards of $4,450 each. With the intent to include more of our neighboring community, the information materials and application were both made available in Spanish. A live translation to Spanish was provided during the final In-Person Info Session for the first year as well, held at Southern Exposure. The awarded public projects will take place in the counties of San Francisco, Alameda, and Contra Costa. 17 recipients were selected: A Single Drop, Chispa, Emergent Landscapes, FILF, Heavy Breathing, HUSH-HUSH, JAGAH, Kalahati Project, SAMA Collective, Oakland Summer School, Off the Walls/Talking Murals, Open Windows Cooperative, The Burl Concentrate, The Church of Black Feminist Thought,The Milkbar, The Walk Discourse, and We Stay Here Pintando Juntxs. An outside panel of three organizers including Natalia Mount of Pro Arts, Justin Carder of Round 10 grantee E. M. Wolfman Books, and Julia Cole, who administers Kansa City's Charlotte Street foundation Rocket Grants program, selected the final grantees. We are all incredibly impressed with the stellar quality of the applications received in 2018. The program, launched in 2007 in partnership with the Andy Warhol Foundation for the Visual Arts, was developed in response to the dynamic work of artists and small groups that have long been emblematic of the San Francisco Bay Area's arts community. Now in its twelfth year, Alternative Exposure has awarded $793,350 in direct funds to 201 Bay Area projects to date. In 2017, Facebook’s Artist in Residence program provided additional funding to expand visibility for grantees with short video documentaries about their projects and a culminating daylong summit in Spring 2019. Southern Exposure is committed to continuing to serve as a resource for the independent visual arts community through Alternative Exposure and our other programs. 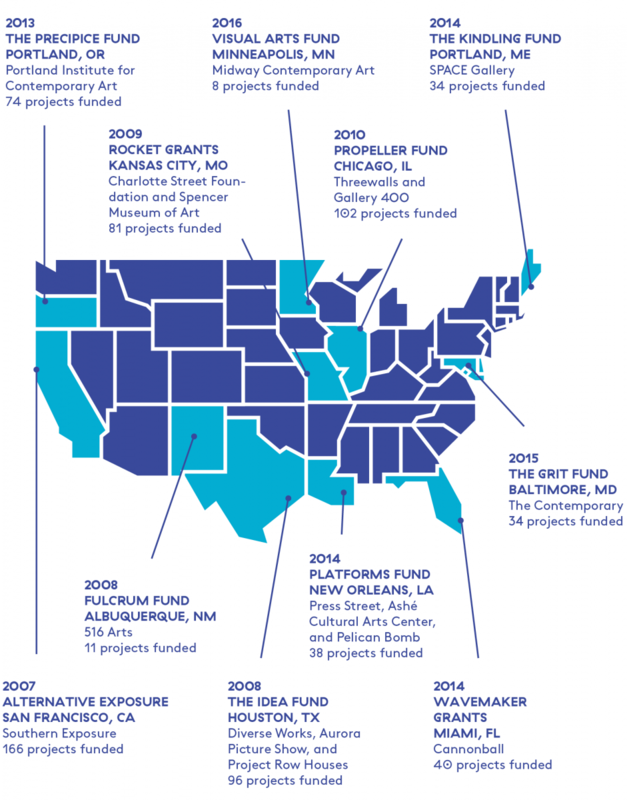 Since developing Alternative Exposure with Southern Exposure, The Andy Warhol Foundation has invested in the creation of a growing national network of regional regranting programs. The Warhol Foundation aims to support the independent creative activity of artists by partnering with leading artist-centered, visual arts organizations across the country. Groups like Southern Exposure allow them to reach the sizeable population of informal, non-incorporated artist collectives and projects. SoEx is proud to be the inaugural member of this important and growing nationwide system of support! With iiiahh’s portable collections, the visual arts can become an everyday yet odd neighborhood encounter full of things, pictures, and words.